Elsie Lavender and Homer Hickam (the father of the author) were high school classmates in the West Virginia coalfields, graduating just as the Great Depression began. When Homer asked for her hand, Elsie instead headed to Orlando where she sparked with a dancing actor named Buddy Ebsen (yes, that Buddy Ebsen). But when Buddy headed for New York, Elsie's dreams of a life with him were crushed and eventually she found herself back in the coalfields, married to Homer. Unfulfilled as a miner's wife, Elsie was reminded of her carefree days with Buddy every day because of his unusual wedding gift: an alligator named Albert she raised in the only bathroom in the house. When Albert scared Homer by grabbing his pants, he gave Elsie an ultimatum: "Me or that alligator!" After giving it some thought, Elsie concluded there was only one thing to do: Carry Albert home. Carrying Albert Home is the funny, sweet, and sometimes tragic tale of a young couple and a special alligator on a crazy 1000-mile adventure. Told with the warmth and down-home charm that made Rocket Boys/October Sky a beloved bestseller, Homer Hickam's rollicking tale is ultimately a testament to that strange and marvelous emotion we inadequately call love. Elsie Lavender Hickam received a rather unusual wedding gift from her previous fiance Buddy Ebsen, a baby alligator. Mrs. Hickam adored that alligator and lovingly raised it in the coalfields of West Virginia. When the alligator scared her husband out of the house without his pants, Elsie had to choose between her husband and the alligator. 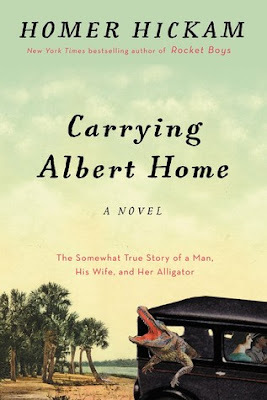 What ensues is the hilarious tale of Carrying Albert Home: The Somewhat True Story of a Man, His Wife, and Her Alligator by Homer Hickam. Imagine the late 1920s and a young woman, Elsie Lavender, raised in the coalfields of West Virginia is now living it up in a pre-Disney Orlando, Florida. She's attending secretarial school, working as a waitress, and enjoying the company of the up-and-coming actor/dancer Buddy Ebsen. Elsie and Buddy get engaged and then he receives a job opportunity in New York city and then California. Weeks and months go by without any correspondence from her fiance, so Elsie returns to rural West Virginia and her family. She receives an unusual marriage proposal from her future husband's boss, ponders the proposal, and subsequently marries the young man, Homer Hickam. After their marriage, she receives a belated wedding present from Buddy Ebsen, a baby alligator named Albert. When forced to choose between her husband and the alligator, she chooses her husband (somewhat reluctantly it appears) with the proviso that they must return Albert to Florida. Now if the picture of an alligator being raised in the coalfields of West Virginia in the 1930s wasn't strange enough, imagine this husband, wife and alligator on the road...oops, I almost forgot the rooster that decided to travel with them. To give you an idea of just how hilarious the travel adventures of Elsie, Homer, and Albert were, you only have to look at some of the titles for sections of the book: How Elsie Became a Radical; How Elsie Rode the Thunder Road, Homer Wrote a Poem, and Albert Transcended Reality; How Albert Flew; How Homer and Elsie Saved a Movie and Albert Played a Crocodile; and, How Homer and Elsie Survived a Hurricane - A Real One as Well as the One in Their Hearts. Elsie and Homer have some amazing adventures on their quest to return Albert home, including foiling a bank robbery, meeting John Steinbeck and Ernest Hemingway, participating in the illegal transportation of moonshine, and more. Elsie even becomes a millionaire for a few hours in North Carolina. The 1000 mile road trip this couple took provides some poignant and heart-touching moments along with some outrageously funny moments. Carrying Albert Home: The Somewhat True Story of a Man, His Wife, and Her Alligator is much more than a story of returning an animal to its native habitat, it's about letting go of the past, overcoming jealousy, being happy with what you have (without giving up on your dreams), as well as finding and accepting love. Homer Hickam has taken the outlandish and fantastical tales about his parents' trip in the 1930s and made it into a fictionalized story that is a testament to fortitude and love. 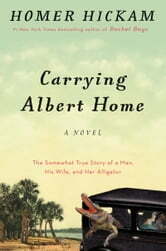 Carrying Albert Home was a fast-paced read for me and one that I enjoyed from beginning to end. (Adding to that enjoyment was the ability to see Mr. Hickam, the author, at the recent West Virginia Book Festival.) Don't put Carrying Albert Home on a TBR list, go out, grab a copy, and then sit down and read it...you won't be disappointed.